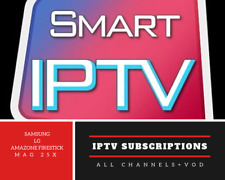 It's subscription SMART IPTV for SMART TV (SAMSUNG & LG), MAG25X, FIRESTICK, ANDROID BOX. 25 Mo minimum connection speed is required, 40 Mo for HD. No channels Adult. This is not a DE-SCRAMBLER service. IPTV SUBSCRIPTION. it's subscription SMART IPTV for SMART TV (SAMSUNG & LG), MAG25X, FIRESTICK, ANDROID BOX. 8 Mo minimum connection speed is required, 12 Mo for HD. No channels Adult. This is not a DE-SCRAMBLER service. 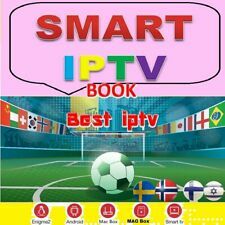 ALL DEVICES THAT WITH SMART IPTV APP. YOU ARE BUYING 1 YEAT SUBSCRIPTION AND YOU. Android devices -- Firestick -- FireTV -- Nvidia Shield -- Smartphones -- Tablets. Smart TVs (Samsung and LG) -- MAG BOX -- IOS devices. WeDO NOT claim any rights on the content of any device or product sold. 25 Mo minimum connection speed is required, 40 Mo for HD. No Adult channels. This is not a DE-SCRAMBLER service. This is just cover support. Bestprice91INC does not stream any of the live IP channels, all channels are third party links available on the internet. We link you with the largest collection of online news, sports, Indian, Spanish etc IP channels any videos from all over the world, they are available online on the web. Trending at $134.78eBay determines this price through a machine learned model of the product's sale prices within the last 90 days. IPTV TV Box is revolutionary internet streaming TV box. This IPTV box provides high quality images. This IPTV box supports 3D and Blu-Ray. R69 HD الروبوت IPTV BOX وأي فأي استقبال بدون طبق. Km5 HD Android IPTV BOX 4k wifi Receiver without dish. 🔥 Ultimate HD Subscription🔥. 6000 Premium Channels spread across the World Mostly in Quality HD. VOD with updates every week. No vpn needed. Nice Tidy Setup Making Channels Easy to Find. 🔥 Sports, Movies. This smart Android TV Box will bring you much fun. - Support 2.4GHZ/5.8G Dual Wifi, 802.11a/b/g/n. Bestprice91INC does not stream any of the live IP channels, all channels are third party links available on the internet. 25 Mo minimum connection speed is required, 40 Mo for HD. WeDO NOT claim any rights on the content of any device or product sold. No Adult channels. This is not a DE-SCRAMBLER service. This is just cover support. MAG322W1 updated MAG254 MAG256. Built in WIFI (150m). 3D Video Support. The set-top box plays advanced 2D and 3D graphics with OpenGL ES 2.0 support. Ethernet 100 Mb/s. We do not provide any TV Channels, Subscriptions or any other Audio/Video Content. Shipping from Canada & USA. Fast Free Delivery!! IPFOX CLUB - 14. The Arabic IPTV TV Box is revolutionary internet streaming TV box. This IPTV box provides high quality images. This IPTV box supports 3D and Blu-Ray. (1x) IPTV Player. · This is the Best Arabic TV Receiver ever in the Market. · Just like all the other IPTV devices. Full 1080P HD video decoding, 4K Video Playback, support H.265 video format. · New on the faster Luna TV box with the ability of watching your smartphone videos on your TV. MAG322 is a unique open platform. You can make changes to our set-top box software as well as integrate it with other developers’ software. 150M WIFI ADAPTER. 3D Video Support. The set-top box plays advanced 2D and 3D graphics with OpenGL ES 2.0 support. GREAT box with 1 year of EXCELLENT service. MAG322 updated MAG254 MAG256. 3D Video Support. The set-top box plays advanced 2D and 3D graphics with OpenGL ES 2.0 support. We do not provide any TV Channels, Subscriptions or any other Audio/Video Content. Dreamlink DLITE Main Features Your Dreamlink Dlite contains Dreamlink Dlite. THE LATEST IPTV EXCLUSIVE QUAD CORE CPU. POWERFUL COMPATIBILITY THROUGH EMBEDDED ANDROID OS (KITCAT 4.4.2). THE MOST SIMPLE AND INSTANT ACCESS TO TV CHANNEL IN THREE SECONDS. MAG322 is a unique open platform. You can make changes to our set-top box software as well as integrate it with other developers’ software. 600M WIFI ADAPTER. The set-top box plays advanced 2D and 3D graphics with OpenGL ES 2.0 support. USB 3G/HSPA Modem. USB IR Receiver. The STB can be hidden in a cabinet, behind the TV set, or built-in the wall or ceiling. USB Hard Disks. The USB ports provide high-power to able to power up most popular USB Hard Disk. IPTV TV Box is revolutionary internet streaming TV box. This IPTV box provides high quality images. This IPTV box supports 3D and Blu-Ray. x96 Mini 2g/16g HD Android IPTV BOX 4k wifi Receiver without dish. This IPTV box provides high quality images. This iptv 1080p It can play movies from a hard disk. Best High Performance KIII Android iptv box For Caribbean. This is the Best Caribbean iptv- TV box Receiver ever in the Market. This IPTV box supports 3D and Blu -Ray. (1x) Arabic IPTV Player. WeDO NOT claim any rights on the content of any device or product sold. (1x) HDMI Cable. Limit ed Quantity Available, Order Now! 2year Free warranty. The Arabic IPTV TV Android Box is revolutionary internet streaming TV box. 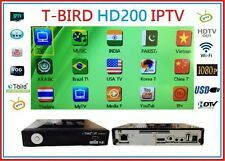 This IPTV 3500 box provides high quality images &. This IPTV box supports 3D and Blu-Ray. · 1 x Mirage iptv box. Wifi speed required 25mbp & more. Arabox Arabic IPTV Box رسيفر القنوات العربية. سيتم استلام المنتج ومعلومات التواصل معنا في حال وجود أي استفسار او المساعدة أو لتجديد الاشتراك وهو بقيمة50 دولار للسنة الاضافية بعد انتهاء الاشتراك الحالي. Best Arabic HD IPTV TV Box Internet WIFI Receiver Channels. • The best device to watch Arabic channels online without shower. • The device contains more than two thousand channels including more than seven hundred Arab channels including all the Arab channels required. Bangla Channels: Sangsad, BTV Bangla, ATN Bangla, Channel-i Bangla, Bangla NTV, ATN Bangla News, Diganta, ETV Bangla, Channel 9, Bangla Vision, Desh TV, Tara Newz Bangla, Deshi TV. BTV Android (JUNE 2018 ) INDIA. The Arabic IPTV TV Box is revolutionary internet streaming TV box. This IPTV box provides high quality images. This iptv 1080p It can play movies. This IPTV box supports 3D and Blu-Ray. (1x) IPTV Player. 3D Graphics OpenGL ES 2.0 (Mali-450 quad core). · We are not responsible for technical difficulties with IPTV providers. The fastest IPTV Box in the market. The set-top box plays advanced 3D video processing and display. This device, therefore, runs quickly and with minimal network load. With cable subscriptions dwindling every day, people are looking to different ways to consume their favorite shows. While some turn to streaming services like Netflix, others are still fond of the setup that televisions use. For those people, an Internet Protocol television (IPTV) box is a great way to stream their favorite shows in HD through an internet connection, all running in real time just like with cable or satellite. Is a smart TV required to use an IPTV box? In general, you will not need a smart TV to use an IPTV box or related device. The only requirements for most IPTV devices is a working internet connection and a port to connect the box to your television. In most cases, this will come in the form of a USB port, though other connections may also be usable, including a wireless connection in certain cases. Inexpensive adapters are also available on eBay to help you get things setup however your TV is enabled to do so. What services does an IPTV HD box offer? Live TV: This is the simplest option that is almost universal among these devices. Live TV allows you to watch television as it is airing through traditional means. Time-shifted: If you miss something or just want to go back and watch a show after it's already aired, time-shifted media allows you to rewind or replay the broadcast so you can get caught up. How far back you can rewind will depend on the particular box. On demand: Similar to many streaming websites and services, some IPTV boxes allow users to watch movies and shows stored in a library of available media, either for free or at a cost depending on a number of factors. What are some brands of IPTV HD devices?